The Short Tragic Life of Robert Peace rested in my Kindle, behind several other books I intend to get to for several months. But, it was the picture of a young Robert Peace, standing on the porch of what I assume was his mother’s home, that peaked my interest. I saw a young man who could be my cousin, brother, even son and I decided to open the book and read the first few pages. It opened to dialogue, common, honest, and familiar: Hot car, hot day, with the air-conditioning off because of what it does to the power, fuel consumption, and / or mechanics of the vehicle. This was the primary indicator that the story would not only be about social development but the economic deficiencies that directly affects the unacknowledged caste system that permeates throughout this country. The resonating question, not only from my reading but the readings of others, was: Did Hobbs really know Peace, or was this an opportunity for him (Hobbs) to write a book that would put him on the literary map? Here, from my perspective, is the reason: The Short… presented scenarios that were predictable; pulled directly from the headlines of any metropolitan newspaper, internet feed, or the evening news. The full title, for example (The Short and Tragic Life of Robert Peace: A Brilliant Young Man who Left Newark for the Ivy League), reveals the story’s premise and total outcome before the first word is read. Although this was a peeve, it was not enough to halt my desire to read Robert Peace’s epic tale. Hobbs addresses the socio-economic issues with as much patience and care as his literary imagination and talents would allow, but here is where [I felt] the disconnect began. Hobbs, perhaps without full acknowledgment, or maybe without full knowledge, emphasizes the economic struggles of the people of Newark, relaying to the reader that this place, nicknamed “Brick City,” was a certain Brick Wall. With a host of characters and personalities, he provides a semblance of proof through images of drug abusers, baby makers, miscreants and a healthy sprinkling of fence-sitters. Peace was “Brick City.” He was the embodiment of this sometimes chaotic but highly loved town. His life was metaphorical, pathological and sardonic. The stereotypic elements were glaring, and for the greater percentage of the book, a darkness loomed, even when Hobbs tells of Peace’s escape through extensive travel. The sometimes overly academic passages seemed to be laced with apologetic innuendos, beginning from the first chapter, continuing through Hobbs’ admission of his prosperous life and ending with a tragic, lump-in-the-throat finale. 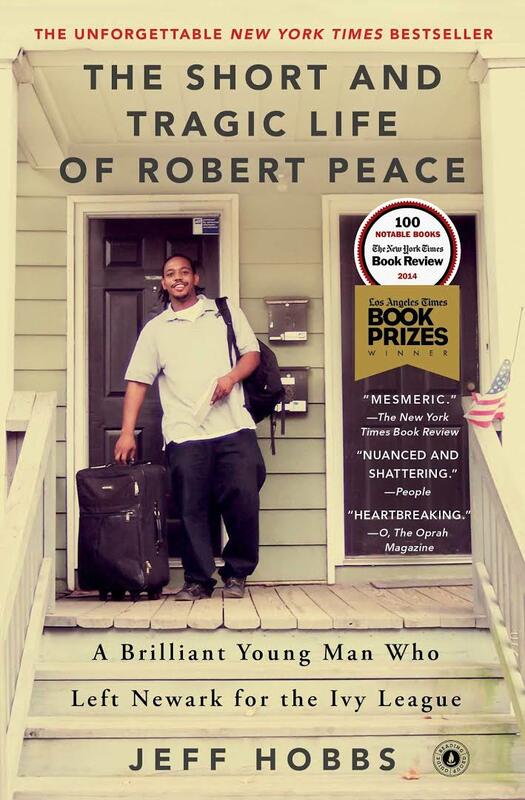 Perhaps Robert Peace’s downfall was that his father was imprisoned for a heinous crime, his mother struggled financially, and that he was cursed with an academic gift in a place unable to adequately appreciate or fully understand those gifts. He was caught between two worlds and the balancing act proved deleterious. But his mother and father (even from prison), (Hobbs tells of their not being married, but indirectly together), kept him on a relatively straight path. Despite family, intellect, honest friendships, the ability to reach beyond his grasp and acceptance to the Ivy facades and secret societies of Yale, Peace found his greatest solace in an endless consumption of marijuana. And the story, at this point, became one of inexplicable addiction by a man-child who had the world on a string. But something greater than the environment and experience drove Peace to become who he was. He, with his multidimensional genius mind, became, from my perspective, a madman; an obsessed scientifically talented phenom who chose to live in a life undefined rather than apply his skills to the mission that would ultimately give meaning to his existence. Taking odd, low-end employment, using and selling cannabis (he created a more potent strain of marijuana by extracting and adding THC “oil”), and wasting time trying to figure out next steps. Regardless of how long he lived, his life because of his lifestyle would still be considered short. When Peace’s end came, Hobbs drew on drama, but the actions and movement of the story were so sudden, so climactically awkward, that the effects, in some parts, were lost. Hobbs still had the ability to draw us in; to keep us wanting to turn the pages and find out the already known. Rich or poor, we are, in many ways, Robert Peace.